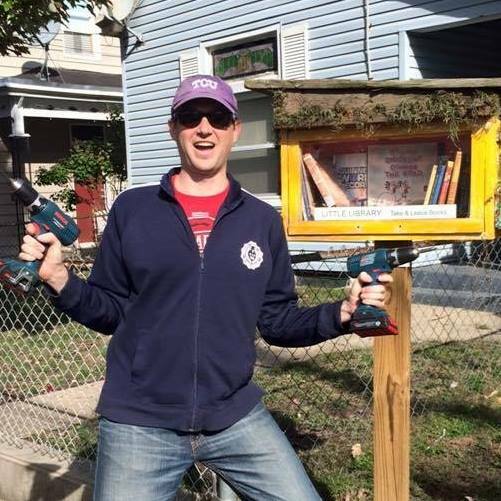 Ryan Salzman, local Little Library Enthusiast, wants to install YOUR Little Libraries by Dec 1. Ryan Salzman has many titles. Assistant Professor of political science at Northern Kentucky University. Member of Bellevue's City Council. Little Library Enthusiast. In May we talked about the 40 little libraries set to spring up in Fort Thomas, Southgate, Bellevue, Dayton and Newport. All 40 were purchased, but many purchasers have yet to install their Libraries. Determined to make these Little Libraries available to the public, Salzman has made a promise to install two Libraries for people who have purchased one Thanksgiving weekend, and 13 more by December 1. What's required of you? Simply email him. Salzman moved to Bellevue in 2012. A year later he noted a Little Library that had been installed across the street from St. John United Church of Christ on Fairfield Ave. "It just blew my mind," Salzman said. "As an educator myself and an advocate for early childhood education, I thought it was such a simple way to encourage reading." So, he decided to make one. Although raised by artists Salzman laughs noting his lack of artist genes. Still, he followed through. He even bought a table saw. Soon 10 Little Libraries were up in Bellevue. JC Morgan, director of Campbell County Public Library got involved. This led to the "Little Library Big Build" at Campbell County Public Library's Newport branch this spring. Salzman had already done the work to ensure the Little Libraries were compliant with area city codes. Morgan, who headed the event, recruited woodworkers, who tweaked Salzman's design. And Danielle Heiert, a Campbell County high schooler, did a lot of the Big Build's leg work as part of her Girl Scout Gold Award project. Forty libraries were built during Campbell County Public Library's "Little Library Big Build" this spring. Together, Salzman, Morgan, Heiert and Campbell County community members built 40 Little Libraries, which they sold to residents for a fraction of the actual cost—$10 each. Residents were encouraged to decorate their Libraries and for those who needed books, Campbell County Public Library offered free bags of books to fill the small boxes around town. But, as Salzman noted, life happens. Work, school and kids take priority, and like so many projects started with good intentions, for many, finishing the Little Libraries is still on a to-do list, one that's often already quite full. And so many Little Libraries are sitting in basements, not yet installed. The prospect of the long upcoming Thanksgiving weekend got Salzman thinking—what if he and his father-in-law, John Cunningham, took a break from visiting family, got some fresh air and installed at least two Little Libraries for people who have been unable to do so. So Salzman contacted Morgan who, in turn, emailed the recipients of the libraries. So far they've had two responses—one Little Library owner in Fort Thomas, another in Bellevue. Excited about those installs, Salzman wants to do more. Ryan Salzman standing next to a decorated Little Library. So if you are one of the lucky recipients of a Little Library that is not yet installed, consider emailing Salzman (ryanwsalzman@gmail.com). His passion in the project is clear and he would love nothing more than to get your Library up and running. And for those who have since decided running a Little Library isn't for them, no worries. There's a waiting list. Simply return your Library and it will be passed to the next person in line. Interested in owning a Little Library but aren't on the waiting list? Contact the Campbell County Public Library, Salzman says. "If we get enough demand, we'll do it again." Plans to build your own Library are available here, as well as tips on waterproofing and maintaining your Library. In addition, Salzman is so passionate about the project he's happy to serve as a one-on-one consultant with anyone who is interested in building their own. Love the idea but don't want to invest the time in maintaining a Library? Although Little Library owners can get free books from Campbell County Public Library, many owners still appreciate donated books—particularly children's books. Salzman often comes home to find boxes of donated books on his doorstep. He currently has thousands of books in his basement that he distributes to Little Library owners on a regular basis. But owners do go through books quickly. Salzman says he started tracking his Little Library and while a lot do get returned, many don't. He estimates he loses one a day, which has resulted in more than 720 books gone. And to Salzman, that's not a bad thing. He believes books checked out for good are still books being read—still children, in particular, being given something they may not get at home. Often he's asked, "What if you went three houses down and discovered a child had piles of Little Library books under her bed? Would you be upset?" His answer: No. "That girl probably would not have any books if not for the Little Library," Salzman says. "And to add another layer, if I tried to give her books she probably wouldn't take them. But this way, she can get them on her own and be inspired to read and fall in love with reading. ... It could have that kind of impact. That would be worth it. And to think that people would think that's a negative thing? That's a dream come true." In addition to promoting reading, Salzman says Little Libraries promote community, too. He's met many neighbors poking through his Little Library, and he's engaged them in conversation. "We can all make our communities better together," Salzman says. "Little Libraries are a perfect example of how to make communities better in a very individual way." But perhaps most important is the role they play in encouraging literacy. "Little Libraries are essential to encouraging early childhood literacy and literacy throughout life," Salzman says. So if you have a Little Library tucked away in your basement, contact Salzman. Or if you like the idea but don't own one, consider building your own. For as Archibald MacLeish wrote in "The Premise of Meaning in the June 5, 1972 edition of American Scholar, "What is more important in a library than anything else—than everything else—is the fact that it exists." Teri, feel free to contact me, JC Morgan, at the Campbell County Public Library if you would like to talk more about the Little Libraries. Thank you! Check out the official site for Little Free Library. It has a lot of cool info about LFL's worldwide, as well as steps to register your LFL to make it official.